Gary Loffler was born in far upstate New York halfway through the last century. 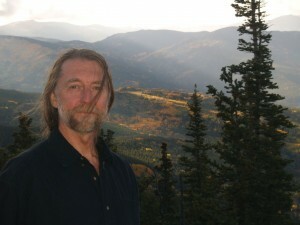 He resettled in Denver, Colorado in 1980 and has remained in the area since. Science Fiction and music have been the two constants in his life. He has flirted, with various degrees of success, with bicycle racing, photography, marriage and various types of employment. Storytelling grew out of my natural tendency to teach. Over the years I learned to communicate because I had to for my continued employment. When you train people for a living, it is important to be able to teach why as well as how. Once you get through to someone on why they should do something, the how is easy. Speaking well does not always translate to writing well, but it is a good place to start. My inspiration to write is often nothing more than problem solving. I create a situation for a character and then figure out how to get them out of it. As I am working on a trilogy, I have to have a vague outline. However, I mostly write as I go. Typically I will have whatever scene I am working on roughed out in my head before I sit down in front of a keyboard. I run for exercise and nothing takes my mind of the pain and boredom than wrestling with a plot point. When I know I am going to reference a scene later, I will add to a notes page that I create for each book. These note pages are cluttered with thoughts, descriptions of characters and places, and often the physical dimensions of various spaceships. No. I always view the characters and situations from the outside. I do not role play any of the characters I create. Carpenters have a rule: Measure twice and cut once. Authors need to write and then reread, then rewrite and then edit and then read the whole damn thing again. Is your character speaking in a consistent voice? Are your tenses straight? Are you using the thesaurus enough? Too much? Are you repeating words too often? Do your sentences make sense? Work on your ability to tell a story well but also work on your technique enough that grammatical or word usage errors do not get in the way. For me the best option was to simply do an ebook through CreateSpace. I have a budget for promoting the book but it is not enough to get my name out to all the largest outlets. Getting a publishing contract from a major player is unlikely and a little worrisome. Those contracts are not written with a writer’s best interest in mind. Also to be fair, I have no track record to entice a book publisher. Self publishing is easier than ever. At the very least it gets your book out there where people can read it. Books are a form of popular media and therefore are subject to the fits and whims of the general public. The best book of the year will never be the most popular. Series have continued to be a successful form because often a reader is not ready to be done with a character or a world after only a single book. Eventually ebooks will be the preferred medium for written works (technically that should be typed works) but paper copies will have a place in archival settings for a long time. I worry that DRM issues will cause readers to lose access to the items they have purchased.